Kids, tweens, teens and adults can find something fun to do each day at Beaches Turks & Caicos resort. There are lots of activities and entertainment options from morning to late night. The Caribbean Village pier is a hub for watersports and excursions at Beaches Turks & Caicos. Beaches has a surprisingly good fitness center with strength-training and cardiovascular machines, free weights and a studio (with heavy bags). There are daily fitness classes in the gym and around the resort, including: yoga, Zumba, Tabata (bootcamp), a pilates-like ab workout and pool aerobics. Pool activities run daily from 11 a.m. to 3:30 p.m. at both the Iguana and Italian pools. There are other fitness activities, like tennis clinics, that run from 7 a.m to 3 p.m., Monday to Friday. Surf simulator (in the waterpark). Only licensed divers are allowed to go scuba diving, but the resort offers dive classes and certification (for a fee). A ‘choo-choo train’ runs between the French, Caribbean and Italian Villages. It’s popular with the children in Camp Sesame (ages 3 to 5). Every day, from about 10 a.m to 4:30 p.m., the kids’ club organizes events for children, tweens and teens. Sesame Street characters host little ones, culminating at 6:30 p.m. each evening with a stage show at the open-air French Village theater. For teens and tweens, there are pool and beach activities all day, group dinner at 7 p.m. and a disco each night from 9:30 to 11 p.m. The best family-friendly water activities are in the waterpark at Pirates Island. Toddlers can enjoy a playground built around a pirate ship full of sprinklers and slides. Older children have two slides and a dedicated pool at their disposal, including a swim-up bar that serves juice and "mocktails." The waterpark also has a lazy river, three full-sized slides and a surf-simulator! The waterpark closes each evening at 6 p.m., but on Thursday nights, they open it back up for a “Wet Fete” hour between 7 and 8 p.m. It’s a good way to enjoy the park when it’s less crowded. There are games like billiards, air hockey, table tennis and an Xbox lounge around the waterpark. There are also oversized chess boards and croquet sets on lawn areas. The watersports pier in the Caribbean Village is transformed into a barracuda-watching vodka bar in the evening. It’s a beautiful place to watch the sunset above and the tropical fish below. Cricketer's Pub and Turtles Lounge host adults-only events like karaoke and poker nights, starting at 10 p.m. A kids' version of Karaoke Night is run at Bobby Dee's from 8:45 to 9:45 p.m. This is Elvis the Barracuda. He hogs the light. The Barracuda Bar is a new addition to the resort, and a fun stop for the whole family. The watersports pier in the Caribbean Village is converted into a quiet vodka bar with underwater lighting. 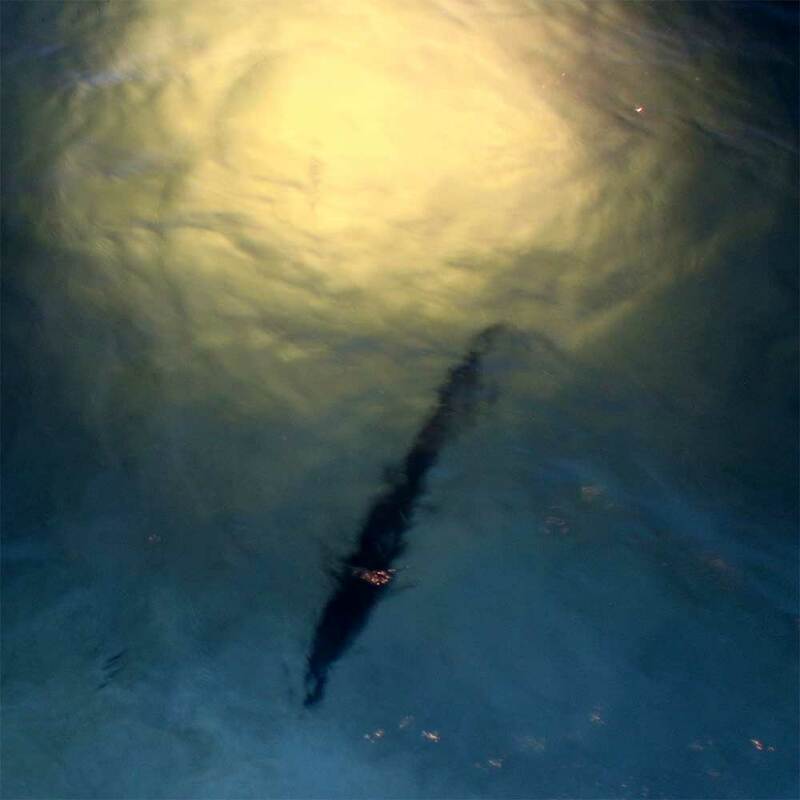 A gigantic barracuda nicknamed "Elvis" hangs out near the pier sometimes. It's awesome whether you're having a cocktail or not! The Friday evening Beach Party at Treasure Beach (in the Caribbean Village) is fun for all ages. The party kicks off at 6:30 p.m. with a Sesame Street show and face painting for kids. Later, there is a variety show that includes dance contests and skits. Kids can stay up by the stage all evening long while parents sit back with their toes in the sand enjoying a drink and the huge spread of foods offered at the Grand Island Buffet. There is live music on the beach by Schooner’s restaurant and also at the Key West Village fire pit every night from 7 to 9 p.m.
Adults-only entertainment kicks off at the Cricketer's Pub and Turtles Lounge at 10 p.m., including concerts and dancing nights. The Club Liquid night club is open to adults from 11 p.m. to 2 a.m.
Reggae Night is fun to watch or participate in. Know this: Volunteering to go on stage means that you’re joining a dance contest. The main entertainment stage in the French Village hosts plays and variety shows. Our daughter loved “Treasure Island” but was afraid of the actors dressed as animals in the “Jungle Book Live”. On the other hand, we really enjoyed the Cirque du Soleil style acrobatics using rings and ropes. Other favorites were “Turks & Caicos Culture Night,” which includes traditional dancing and music (and even a fire dance!) and “Reggae Night,” which includes a dance contest. During an adults-only show called “Dolce Vita” (which we liked less than the family shows), there is a huge chocolate buffet adjacent to the stage. Pirates Island hosts a movie night for kids at the same time, so we enjoyed the chocolate desserts on our own with a cup of excellent coffee from Cafe de Paris. Later, we brought our daughter some treats and watched Finding Dory together. Several glass bottom boats go out each day. These rides fill-up quickly and reservations need to be made well in advance. We had fun on the boat, but we weren't inspired to take a second voyage. If you are lucky enough to have a room with Concierge Service, the one-hour cruise party looks like a good time. (We botched the timing two years in a row!) It takes place at 4 p.m. on Thursdays and requires reservations. The only negative is that the cruise takes place at the same time at the Family Tie Dye party at Pirates Island. Thankfully, there is also a Tie Dye party at 4 p.m. on Tuesday. The fish fry is a Turks & Caicos tradition that happens on Thursday nights across the island. Beaches cleverly runs a casual, island-style fish fry on Wednesday nights to save you the time and cost of venturing off the resort (why not both?!). Handcrafted souvenirs are on display at the event. Local craft vendors also feature their items for sale daily from 10 a.m. to 4 p.m. in the roundabout outside the Caribbean Village lobby.